To Capture the Iconic Scene or Not? Our third day in Moab started well before daylight as we had a longer drive into Canyonlands National Park to visit Mesa Arch. Robert warned us, while we had been fortunate to have avoided seeing too many others the previous mornings, that this outing would most likely be different. Sure enough the parking lot was packed and it was still dark thirty! If you are not familiar with Mesa Arch, you can google it. It is definitely an iconic location and one of the most photographed locations in Utah. The shot is to set up under the arch before daybreak looking out towards ‘Hand-washing Maiden’ and capture the sun as it rises in the left corner of the arch creating a pinched sunburst while lighting up the underside of the arch. It is definitely a cool image. After hiking down to the arch from the parking lot, the scene we were greeted with was probably thirty or so photographers packed in side by side the full width of the arch. Upon seeing that my first instinct was to take off in the other direction and seek the solitude I enjoy so much. With the Mesa Arch shot, the creativity didn’t exist for me as the sunrise shot has been done thousands of times and there’s really only slight variations of the composition. I enjoy the exploration and discovery of seeing something that moves me and inspires powerful sweet appreciation. I wandered away and around the rim of the canyon and with about a hundred steps, I was able to set up for the sunrise along the rim rock with the Hand-washing Maiden in the middle ground and the La Sal mountains in the distance. The sky was gently lighting up, creating a beautifully expansive image and best of all I was for the most part by myself. I wasn’t disappointed in the least missing the ‘Iconic’ shot as I captured my image that I worked to create that had meaning for me representing that beautiful sunrise. I stayed in the same spot and rotated my tripod to capture the first light on the bluff of the canyon wall with Canyonlands a thousand feet below. 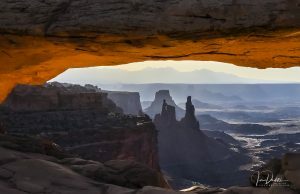 The third composition was on the other side of the arch looking out to the depths of the canyons. I used the Chamonix 4 x 5 to expose a sheet of Fuji Provia 100 for this one. You can see the difference in how the colors are rendered with the Provia 100. On the hike back out, the hundreds of people who had swarmed the area just an hour before were gone. We were alone! I had packed up my camera but couldn’t resist getting an iPhone photo of Mesa Arch as I walked past it, especially since the underside of the arch was still glowing! For the afternoon we drove out past Arches to a location called Fisher Towers. A beautifully expansive location that sets up very nicely for last light. After finding my first composition, looking away from the towers out towards the distant bluffs, I set to work to get everything framed with the dead wood in my foreground. Then I waited for the light to creep down to the edge of a mesa top to my right. My plan, and challenge, was to capture this image and quickly reposition my tripod to get the last light as it rose up the face of the Fisher Towers. The soil lit up with deep reds as the sun got to the horizon. The clouds were perfect, just an amazing scene, one of my favorites. The thing about the light on faces opposite the sun rising or setting, is that it descends or climbs really quick! Not much time at all for me to reposition and capture the image I wanted. I think I exposed two images before the light was off the towers. So to go iconic or not is a choice. I did go for the iconic captures earlier in my Utah trip while in Zion because I had no knowledge of the area and very little time to explore. The images I took there still have great meaning for me so in that circumstance I was happy with that choice as the only other option was not to do any photography. When having the time to explore and create my own composition or stand shoulder to shoulder with a crowd of other photographers and capture an image that has been captured by everyone that visits a location, I choose to explore something different! Thank you so much for taking the time to share in my photography! As always, I welcome your thoughts in the comments below. To view higher res images, click here. This photo is breath taking, I feel like I am there. It really is! I just love being out in these beautiful places! Thank you Lesa!